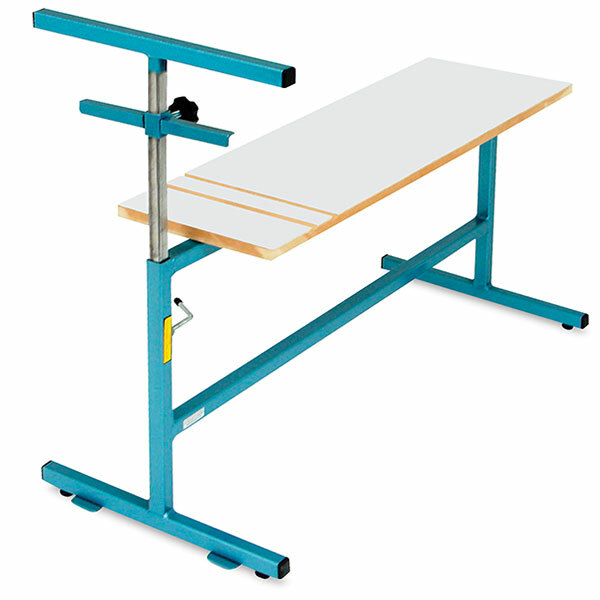 The 2-Way Art Pony from Klopfenstein is a versatile and lasting alternative to flimsy, all-wood drawing benches. Built for seated drawing, it will also stand on end at a slight forward tilt for artists who like to stand while they draw. A sliding T-bar collar and stop tabs on the front foot support the drawing board when in the upright position. The 2-Way Art Pony features a sturdy welded steel frame that supports a ¾" (2 cm) thick solid core seat that is 17½" high and 35" long (44 cm × 89 cm). The seat has a smooth, white Melamine surface, rounded corners, and a groove to anchor the bottom of your drawing board. The T-bar supports drawing boards measuring up to 24" × 36" (61 cm × 91 cm), and it telescopes from 11" to 21" (28 cm to 53 cm) for greater flexibility of drawing angle. The 2-Way Art Pony requires no assembly. Weighs 28 lb (12.7 kg). ™ Klopfenstein is a trademark.® Melamine is a registered trademark.